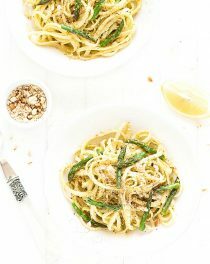 This asparagus almond pasta is simple, requiring just six ingredients (eight if you include the salt and pepper) and 15 minutes! Perfect for a quick and tasty weeknight meal. I love easy dinners that I can get on the table in under 20 minutes especially when I am strapped for time…or just too tired after a long day. 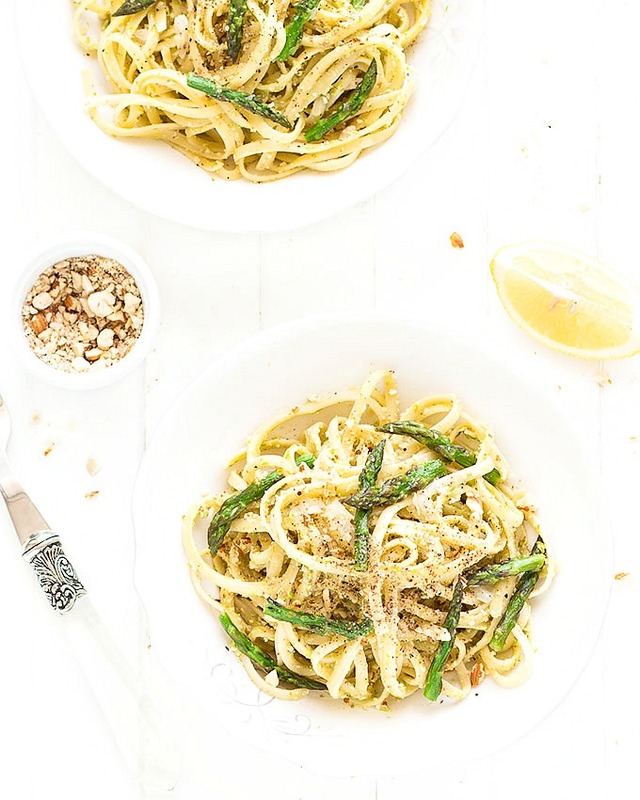 While the pasta is cooking, prepare the asparagus-almond sauce in the food processor: asparagus stalks, freshly grated parmesan cheese, extra virgin olive oil and almonds. The sauce is fresh, bright, creamy, crunchy and coats each noodles perfectly. I used bavette but of course you can replace it with spaghetti or pick something else: tagliatelle, linguine, penne, bow tie, etc. It can also be easily veganized by using egg-free pasta and omitting the parmesan cheese or using vegan parmesan cheese. Often I prepare a double batch as it tastes just as good, if not better, the next day. Serve this asparagus almond pasta with a mixed green salad and a glass of chilled white wine. 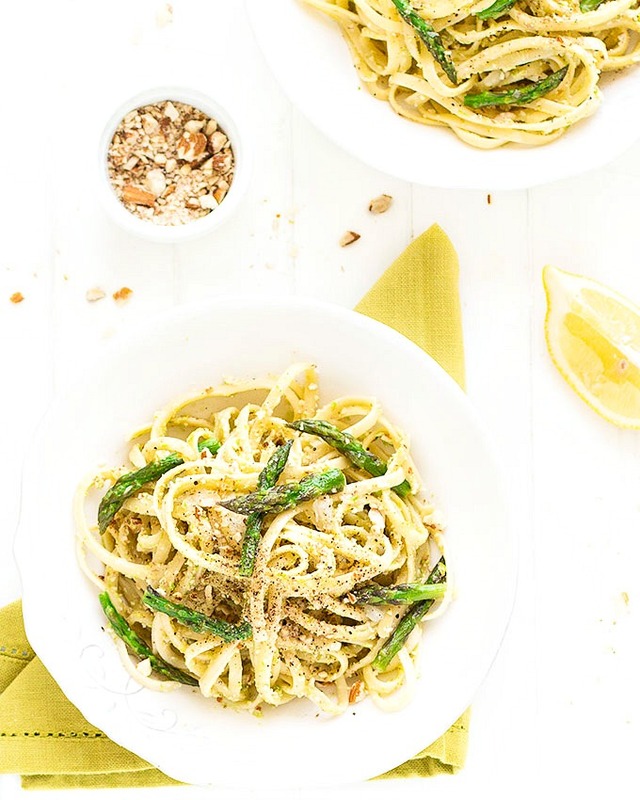 This asparagus almond pasta is simple, requiring just six ingredients and 15 minutes! Perfect for a quick and tasty weeknight meal. Cut off the asparagus tips and tie the spears together with a kitchen string. In a medium skillet, sautee the onion with 1 tablespoon of extra virgin olive oil until soft and translucent. Add the asparagus tips, a 1/8 cup of hot water (taken from the large pot) and season with salt. Add the pasta and the asparagus stalks to the boiling salted water. After 5 minutes remove the stalks from the water and put them in a food processor along with the parmesan cheese, almonds and the remaining olive oil. Blend the ingredients until the mixture is creamy. If it's too thick, add some hot water and blend again. Add salt and pepper to taste. Drain the pasta and save about 1 cup of the starchy pasta water. Return the pasta to the pot, add the sauce, a few tablespoons of starchy water and stir well. Serve the asparagus almond pasta in individual plates topped with the asparagus tips, chopped almonds and freshly ground black pepper. Love that it is simple and fresh. This is a beautiful dish….asparagus is in season so it will be fun to try this recipe. 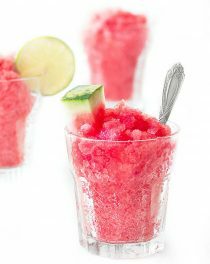 This looks like the perfect summer dish to me! 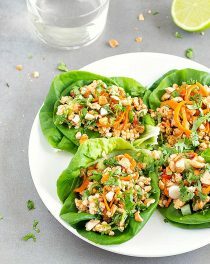 So light and colorful, love the addition of almonds here!